The Massachusetts softball team is looking to turn its fortunes around on Wednesday afternoon following a 12-4 thumping at the hands of George Washington on Sunday, as the Minutewomen (20-16) square off against in-state rival Boston College (14-25). Back in March, UMass defeated BC in Chestnut Hill, 8-3, and look to complete the season sweep of its non-conference foes at Sortino Field. For the Minutewomen to get back into the win column, they look to do what they have done all season. There is no new magical formula for success, according to coach Kristi Stefanoni — they look to control what they are able to control. 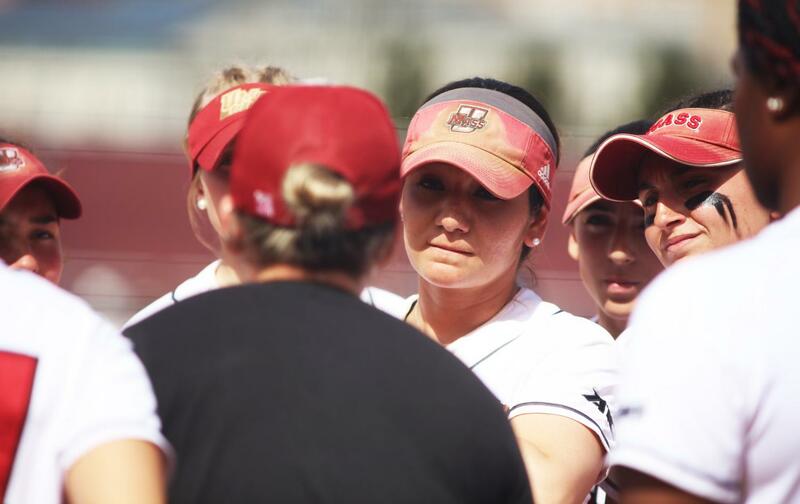 Boston College is led by pitcher Susannah Anderson who sports a 3.58 earned run average and opponents are hitting .262 against the right hander. UMass could also see Camryn Dolby in the circle who is second on the team in pitching appearances with 32 and has served as the Eagles’ regular relief pitcher. UMass will not be intimidated by BC, despite its placement in the Atlantic Coast Conference which includes some of the nation’s top teams. For the Minutewomen, it’s yet another opportunity to compete. One Minutewoman looking to build on her monster weekend is Danielle Ellis. The freshman, who has been used primarily as the designated player or as a pinch-hitter, was named Atlantic 10 Rookie of the Week following a superb effort against George Washington. She went 6-for-8 in the three-game set and also drew two walks. Ellis’ addition to UMass’ lineup can help provide valuable depth which may be necessary to beat Boston College. But, Stefanoni is as excited for Ellis going forward as she is for what contribution she can bring on Wednesday. First pitch is set for 4:00 p.m.
Tim Sorota can be reached at [email protected] and followed on Twitter @timsorota.